Took part in the Hampton Roads Tweetup Photowalk in Olde Town Portsmouth Virginia today. Follow @HRVAphotowalk on Twitter for updates. 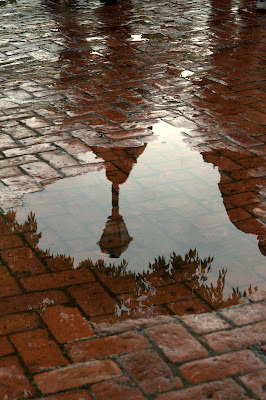 We got thoroughly wet by a sudden rain shower but the puddle produced today's photo. Canon 40D, 1/320 sec at f/7.1, ISO 200, 55mm focal length.